In the East Coast sunlight, I scan the aisles and the silver domes of the pensioners poking up from the seatbacks. To pass the journey, I’m re-reading Nik Cohn’s Yes, We Have No, his account of an alternative, disaffected England. Would anybody pay attention to a similar book out of Scotland? The jury’s out, I conclude, though if it’s disaffection you’re after, Glasgow has it in spades. The sun follows me west. I alight at Buchanan Street Bus Station, which only now I realise isn’t on Buchanan Street at all but behind West Nile Street. Where’s East Nile Street, I wonder? At the AMPM stall I buy a coffee and find the same thin-faced blonde behind the counter. Much as I long to take her picture, she doesn’t strike me as the camera-friendly type. On the benches I find a kissing couple, the girl straddling her beau. Only it’s not that straightforward. Soon I realise I’m witnessing a full-blown lover’s tiff and from what I hear, Kerry’s in a rush to make her getaway but Mark suspects she’s off to see another man. I put the pair in their early/mid 20s – she’s pretty-if-plain, sporting a blue-green velour Primark hoodie and no-brand jeans. Mark wears a dark blue tracksuit, an out-turned, empty pocket protruding disconcertingly from his left hip, as if to advertise the fact he’s skint. Kerry climbs off, announcing loudly, I’m away to two-one-eight then I’m going to see my Da. Mark grips her wrist tightly. He’s a big guy, big-boned and clearly he doesn’t buy her story. Kerry! C’mere a minute. C’mere! She turns, walks back and seeing him in tears, casually mounts him again, wrapping her arms round his head while staring into the middle distance. I feel I’m watching two actors in need of a better script, for now the same lines get repeated over, again and again – two-one-eight, my Da, you’re seeing him, I know you are. At this point I feel like calling ‘cut’. Only I don’t. I catch the underground to Govan, last stop on the inner circle from Buchanan Street station. The plan: to take a look at the landmarks on the Govan Heritage Trail, the graves at the Old Parish church, the entrance to the shipyard and the statues of Mr and Mrs Elder in the park. Sunny Guv-an, as the locals call it, looks to be surviving on new giro money, where community centres, advice centres, training centres are profuse, as are minicab offices, pharmacies and tanning shops. Gangs of youths hang round, spitting, extras on standby for some social-realist film. Opposite, in the Govan Cross shopping centre, a novelty grabbing machine plays the theme from Mission Impossible, the irony lost on the two fat girls attempting to snare a furry creature. On Langlands Road, a couple pass, the woman’s makeup barely concealing the fresh bruise on her left cheek. On Shaw Street, I study a close encased in steel wire, a cage, presumably designed to keep people out, but giving every appearance of a prison entrance. Out of the corner of my eye I spot a fly-looking chappie grinning at me and giving my camera the once over. Aye, and you’ll try, I think. He doesn’t. 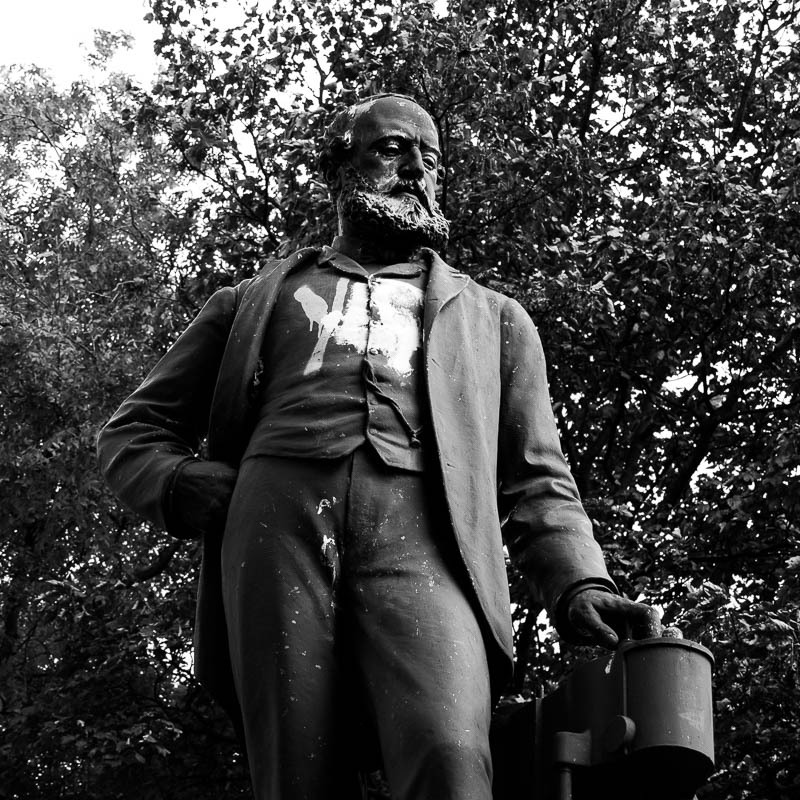 Aiming my lens at William Pearce’s statue, I’m hailed by a man parked in a white van, who asks if I’m interested in local architecture. I crouch in the gutter to meet his eyeline, explaining my purpose, but he’s more interested in telling me about local churches. A minute later, I’m in the van. Tony McGee is small and sparky with very blue eyes and a tan owing more to wind exposure than sun. He’s a steeplejack by trade, so well-versed in the vantage points the city has to offer. 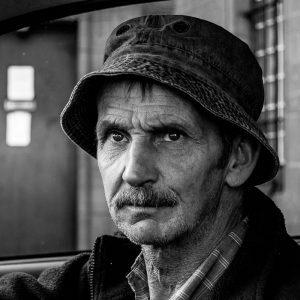 Tony’s story is this – thrown out of the Merchant Navy after seven years for drunkenness, he’s not touched a drop for 25 years. He got into the steeplejack game and knew TV industrialia buff, Fred Dibnah, well, so well in fact he attended his funeral. Steeplejacking took him travelling – the north of Scotland, New York – but with his wife poorly, Tony returned to his native Glasgow, where he built up regular contracts in the trade. Health and Safety is killing the job, he says dolefully, if I pass a church with a dodgy louvre, I can’t just walk in and say I’ll run up and fix it for four hundred quid cash in hand. Now everything has to be referred through official channels, meaning the church ends up getting screwed for eight grand, so more often than not they don’t bother doing the work and some poor soul ends up getting injured. I had a few heart attacks in my 30s, he admits, adding, but I don’t think I want to live for too much longer. I don’t want to be incapable in my dotage. His dream is sell up the business and the house, buy a mobile home in Australia and hit the trail. Better to have a good few years and enjoy what you’ve got, he says. The only snag is the collection, he tells me. I’m intrigued. Tony explains he has a passion for the Napoleonic Wars and has amassed around 10,000 model soldiers of the period, and how each model is painted in minute detail, down to the buttons of the uniforms. These, along with books on the subject and other memorabilia. If I could only work a computer, I could sell it all off, he adds. His late wife was a collector too – bears, Stieff among others, and he recounts how he and the wife would take long car journeys to antique fairs, car boot sales and charity shops in pursuit of their respective passions. After she died, he tells me, I went off my head and jumped in the car and just drove. I wound up in Blackpool. He looks as if still amazed at his impulsiveness in the midst of grief. He describes a trip to Amsterdam made with his daughter, to the Van Gogh Museum after getting stoned in the cafes. He returns to Blackpool. I never realised, he says, that one time my parents danced a waltz in the Tower Ballroom. It made me want to learn to dance, like keeping up a family tradition, so I had lessons. He describes how one time a BBC crew turned up at Community Central Halls in Maryhill while he was attending a dance class. Next thing I know, I turn up on the news. For two months my phone was red-hot with folk calling me to say they had seen me. Me, dancing on the telly. He tears off a letterhead from an old invoice and hands it to me. Tony, or, as he says, Anthony McGee. That’s my number. I don’t have a mobile though – I’m prehistoric that way. If you want, I can get you in to some of the churches and other buildings. I tell him I’ll be glad to take him up on it. Moving on to Govan Road, heading west to the shipyards and Elder Park. 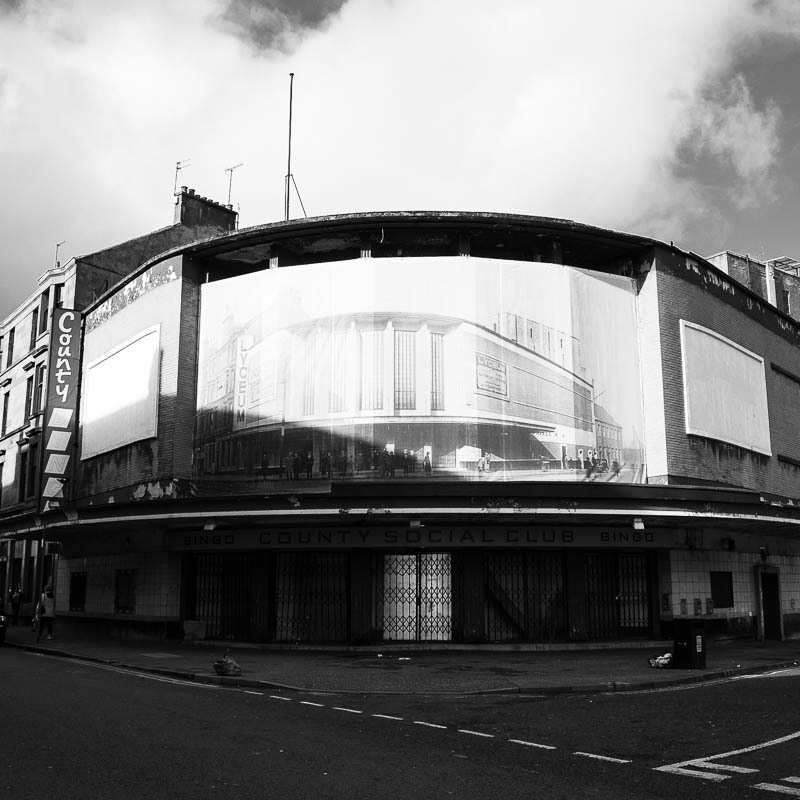 I take shots of the old Lyceum, a 2600-seat cinema designed by C.J. McNair in 1939 which, like virtually every inner-city and suburban cinema fell into decline only to become a bingo hall. Now even that’s closed down. But the building itself remains, a grand, super-confident sweep of 1930s architecture. The traffic’s so sparse I can stand in the middle of the road to take the photograph without fear of being run over. Walking on, I pass rows of pubs and shops, mostly run down, the only signs of life the Cosmo chippy, an African food shop and opposite, an African hair and beauty store. A greengrocer looks like something out of the dark age of my childhood in Kinning Park – a dark hole in the wall with a few boxes of anemic-looking veg. Earlier in the Govan Cross Shopping Centre, I noted a shop selling bulk bags of potatoes and onions, loose pink toilet rolls – benefit fodder, the barest of essentials. I can’t believe that someone thought the Govan Heritage Trail was a good idea. Not when they can’t keep up appearances. As I near the entrance to the offices of the now-defunct shipyard, I wonder – who’s coming here? Is there really any demand to visit this place? I photograph the proud red sandstone statues at the office entrance, thinking there’s something so terribly poignant about the yards. Of course, behind the locked gates, on the other side of the Clyde, BAE maintains its shadowy presence. Military contracts mainly, the type of manufacture that once would have been regarded with an open, fervent patriotic pride seems lately to have receded into a clandestine source of shame in our collective consciousness. We are at war, but how many of us wake up in the morning aware of the fact? Perhaps if bombs were raining on our heads we would pay closer attention. 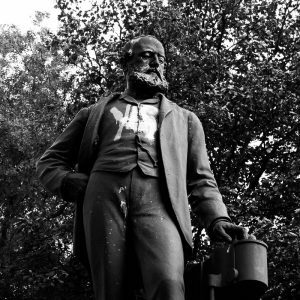 As I gaze up at John Elder’s statue in the 35-acre parkland he bequeathed to the people of Govan, I note he’s daubed with paint, some undecipherable legend – and my heart breaks, not for just Elder, but for the thousands of nameless shipyard workers, my father among them, who have no monument to keep their name alive. Thankfully the park is kept to a reasonable standard as is the nearby library, named after Elder and built in a quasi-Baroque style at a cost of £27,000. It was opened in 1903 by that other renowned industrialist, Andrew Carnegie. A short walk later, I chance on Mrs Elder, sat sternly in her Victorian flounce among the last of the season’s roses. Retracing my steps, the last stop of the day is the Old Govan Parish Church and its yard, a significant landmark, according to Harry Bell’s Glasgow Network of Aligned Sites – and the main pull on my curiosity because of its astounding history. Originally the site of a church and monastery founded by King Constantine (martyred in Kintyre around 576AD) today’s church houses a collection of pre-Christian artifacts, including the Sun Stone, used in pagan forms of worship and a carved stone sarcophagus, the reputed shrine of St. Constantine, discovered in 1855 during the dig for an interment. Not that I can see any of this, since the church is closed apart from services. I make a note of the phone number and promise myself a return trip. 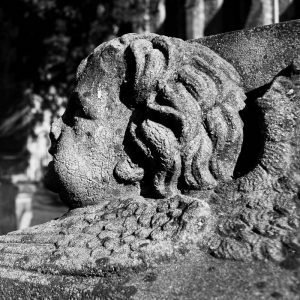 Outside, I photograph a fine collection of tombstones, many dating back to the 17th century, with several bearing masonic symbols and other occult carvings. There is no public toilet to be found, apart from the underground ones at Govan Cross, long closed, like every other in the city. But I need to find one. The Pearce Institute, said to be built over the holy well of St Constantine is closed for the day, I’m told, so I make my way back, passing Wine Alley aka Broomloan Road and Orkney Street Police Station, also closed. Ironically, it’s the only time I see a security firm sign on my entire excursion. Govan it seems, is closed. I could venture into one of the many pubs, but I know I’ll get sidetracked by someone and besides, I’ve had enough tragedy for one day, so it’s back into town by the quickest route. I get off the underground at Cowcaddens, walk along Cambridge Street and into the toilets at West Campbell Street Lane where the attendant tells me her job – and the facility – is under threat of closure by the city council. They’re doing it deliberately, she says. Now they send us down to St Vincent Street, which has only the three cubicles. It’s damp down there and it’s an awful place to work. Here I’ve got the seven cubicles and you can see for yourself, it’s spotless. Clearly the attendants have created a haven; plastic flowers, soap and paper towels, all neatly arranged by the sinks. It’s scrupulously clean. There’s a small box for tips and it’s full of loose change from appreciative users. The woman gives me a phone number. If you could phone this number and complain, she says, otherwise before you know it, this place’ll be left unmanned and then the vandals will come in and it’ll give the council the excuse they need to shut it for good. I look at the note – Environmental Services. I decide to call, not just for me, but for all the old ladies, the shoppers, the office workers and anybody else in need of relief.